Alright, here's the step by step for building this model. Warning: This is an expensive model (in bits alone) and is both time consuming and requires a bit of skill. This is not for you if you're just starting to greenstuff and convert models. Make sure to read the directions all the way through before starting. This tutorial was written because I couldn’t find one that was complete. 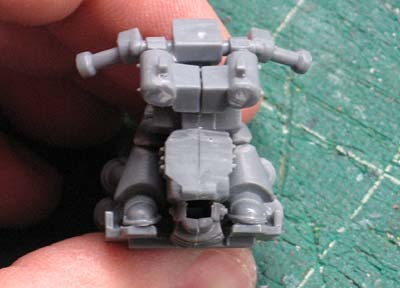 This is based off a similar jetbike tutorial, but the instructions were incomplete at the time I built mine. I decided to try and accurately capture the process of building this one for anyone else who wanted to try their hand at it. The first thing is some modification and assembly of the main part of the bike. You'll need to trim away the front wheel housing and a little bit off the bottom of the bike to include a small portion in front of the lower muffler. The areas shaded in red are what you're trimming off. Once you've got that done, you can glue them together. Don't forget to take care of the mold lines across the top of the bike as well. You don't want to see the seam running down the middle of the gas tank when you're done. I use superglue and I apply it liberally on this seam. 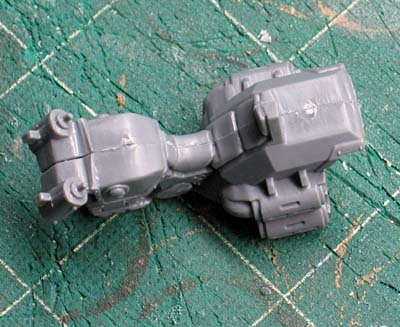 That allows it to fill any gaps and flow out a bit when I squeeze the two halves together. Then I go back with my X-Acto knife and scrape away the mess and you never see it once it's painted. 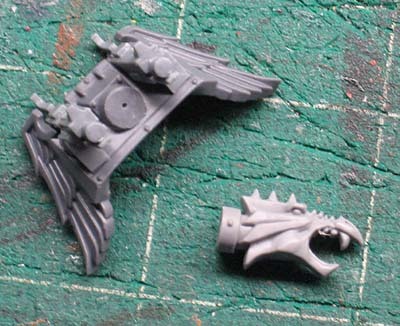 Now's it's time to build the body of one of the Dark Eldar jetbikes. 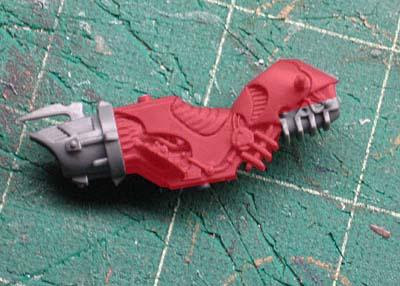 Once you have it assembled and it's had time to dry, you need to cut away the red area. 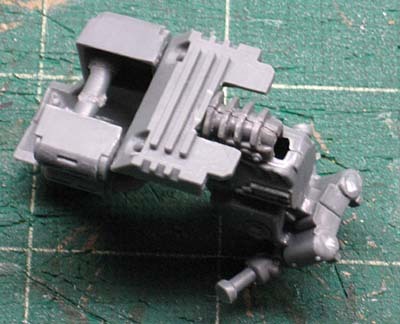 All you need is the small engine piece at the bottom in the front of the bike and the exhaust port off the back. Assembling the kick plate for the bike. You need to do some delicate trimming here. The solid red area gets cut away and the striped area gets trimmed down. 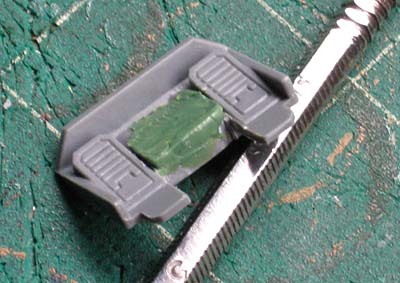 Once you have all that cut away, you go back and greenstuff a low step in between the two foot pedals. This picture shows what you’re trying to build with the greenstuff step. 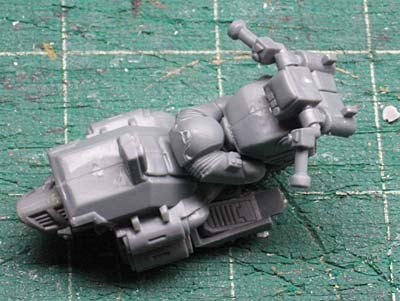 It (the kick plate) needs to be positioned up as close as possible to the body of the bike (A). 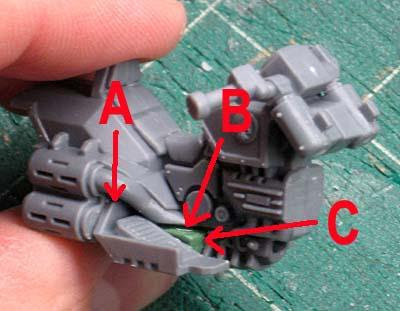 It (the greenstuff step) will act as a filler between the kick plate and the underside of the bike itself (B) and will be the mounting wall for the “engine” later on (C). Do NOT attach the kick plate just yet. 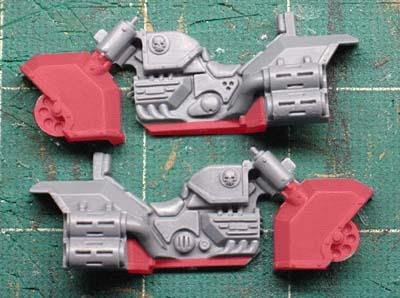 Before you attach the kick plate, you’ll want to clean the grills off the front of the jet bike. It’s easier to do it now without all the other stuff glued in place. This front face needs to be smooth in order to mount the nose of the bike on later. Time to mount the kick plate and “engine” (from the Dark Eldar jetbike) to the bottom of the body of the bike. 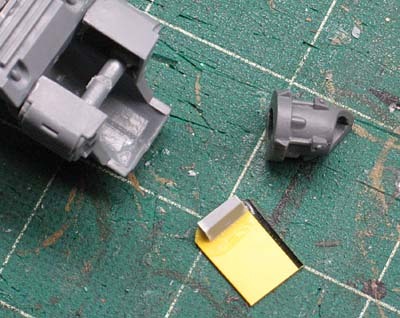 Remember to mount the kick plate flush with the bottom of the bike (See Step 3). 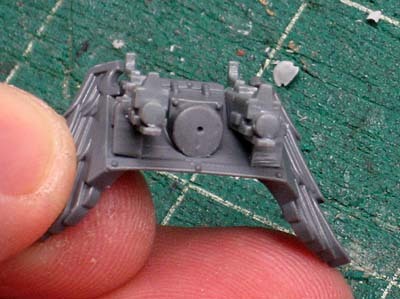 The engine should fit flush with the front of the kick plate. You can also mount the handlebars onto the bike at this point. Time to start on the nose of the jetbike. 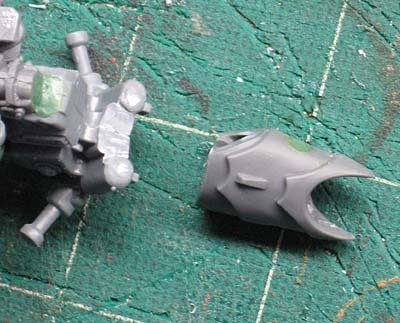 Taking only the TOP halves (one from each Dark Eldar bike) you’re going to assemble the nose now. You’ll need your plasticard later on. Both halves are glued together. Match up your edges as best as possible. Once dry, fill in the holes with greenstuff and smooth them out. 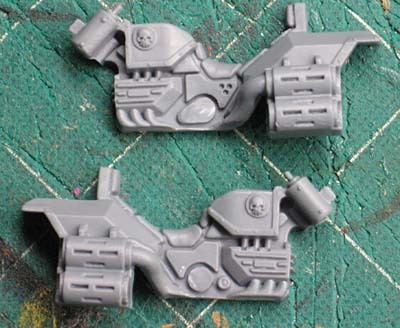 Side note: You can use both BOTTOM halves to build a second jet bike later on if you want, it will have a slightly shorter nose though. Time to work on the rider. 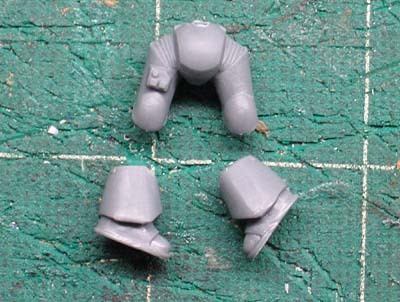 Taking a the regular biker legs, you’ll need to cut them apart at the knees and remove the flex fit stuff between the armour plates. 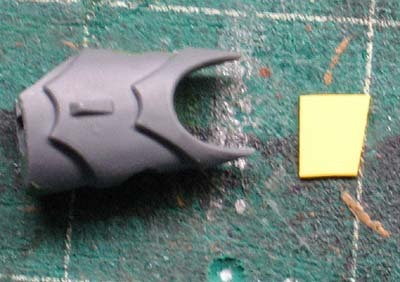 I cut along the edge of the upper leg plate and drew a line across to just under the knee cap. Once you have your three pieces, you should be able to glue the rider’s upper legs to the seat of the bike and then work in each lower leg. Do some test fitting to make sure everything goes together smoothly before gluing. 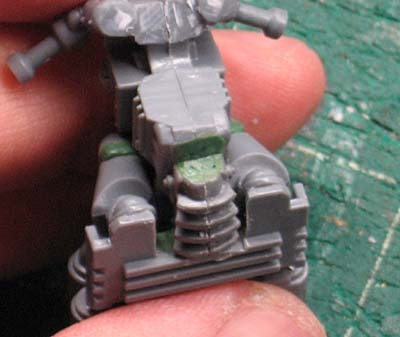 The idea is to get as snug a fit as possible between the armour plates to minimize the amount of greenstuff work you’ll need to do on his knees. Greenstuff the bottom portion of his knees back in place to complete the illusion of him sitting with his legs back instead of forward like they were before. 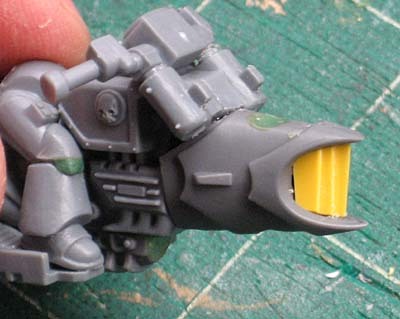 While you still have your greenstuff out, take a little bit and fill in the opening left on the front of the jet bike by the engine. Time to finish the nose of the jetbike. 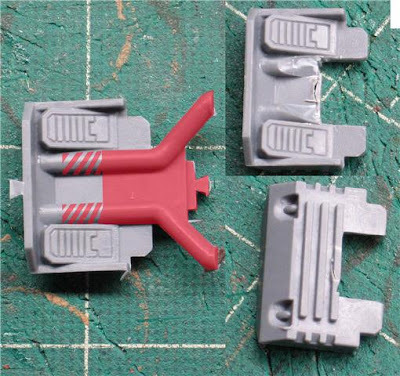 Take your assembled nose and cut off the back portion just behind the second armour plate. You’ll need to angle the top as well. Take your time and work slowly. If you cut off too much, you’ll have problems. You want to make sure you have a good, clean vertical cut so the nose matches up flush with the front of the bike. The angle at the top of the nose piece only needs to be enough so that it fits against the bike without a gap. Do NOT attach the nose to the bike yet. 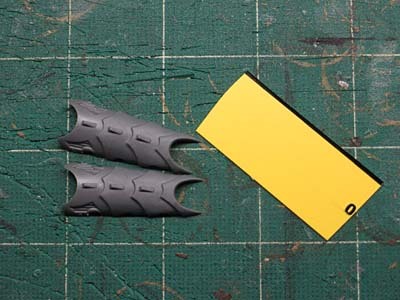 Time to make the fins that go inside the nose of the bike. You’ll need your plasticard and your X-Acto knife. I put three “fins” in the front of mine. 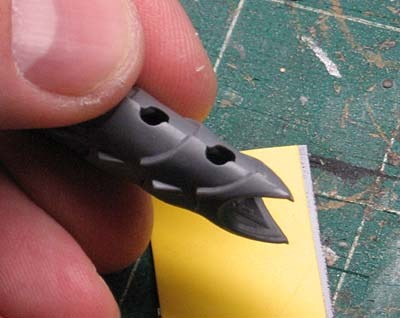 Depending on the thickness of the plasticard you use, you may need more. I would say to not use any less though or it might not look right. I cut my first “fin” and set it in place in the center of the nose. I glued one additional “fin” to each side of that one, but made those slightly shorter than the original one in the middle. This gives them a staggered look like an air intake might have. Now for the rear exhaust vent. 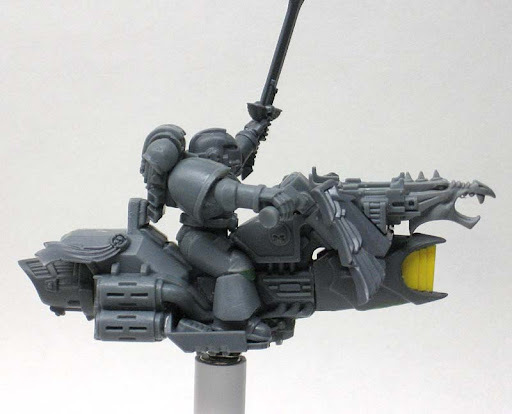 You’ll need the piece from the Dark Eldar bike and your plasticard. 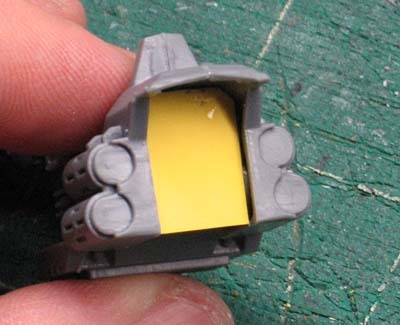 Basically, you’re going to build a simple wall for the rear exhaust vent to mount on and then glue it in place. The bottom of the wall will be braced by the back wheel “axle” and the top will need something extra to support it. I used a bit of sprue glued to the top of the wall on the inside. This gives it (the wall) some extra support. Once you have the exhaust wall in place, you’ll need to build a small spacer so the vent can be mounted properly. I used three layers of plasticard glued together and cut out a square shape with angled corners. Like I said, this is just a “spacer” for the actual rear exhaust vent to be glued to. It doesn’t have to be anything fancy, just something to take up space. Now for the windscreen. I went with the Dark Angels winged version for this bike. The first thing you want to do is cut off the mounting tabs on the front shocks of the bike itself. This is so the screen will mount closer to the body of the bike. Next thing to be removed is the headlight. 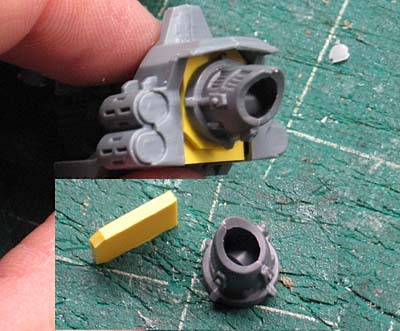 Before mounting the guns, shave away the headlight until you have a smooth, flat surface. 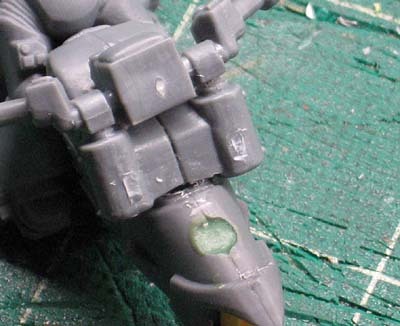 Once the headlight is gone, you can glue the bolters in place. 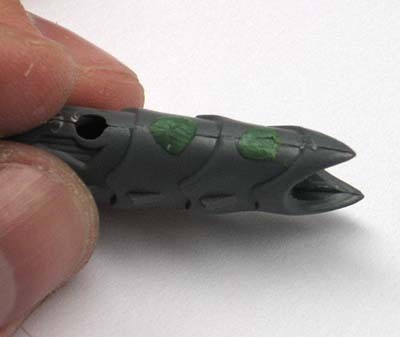 The last part is to glue the Chaos dragon muzzle in place of the headlight. 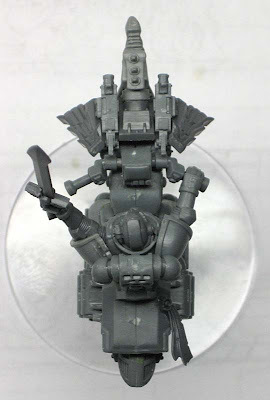 Finish building your rider with whatever torso, arms and such you want and then find yourself a suitable base to mount your new jetbike on. The two pictures below can be clicked on for larger versions. And once again... this is not the end all tutorial for building these things. 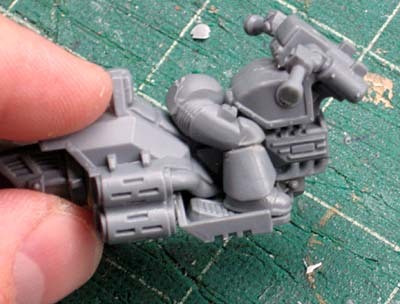 You can make any number of modifications to this to fine tune your jetbike into what you want. The overall idea of this was to document the basic steps so that people had a template to work from if they felt like they wanted to attempt a project of this size. If you want a printable version of this tutorial, Issue 6 of The Astro Mag (pdf link) has this complete tutorial in it. A great tutorial, thanks for that! 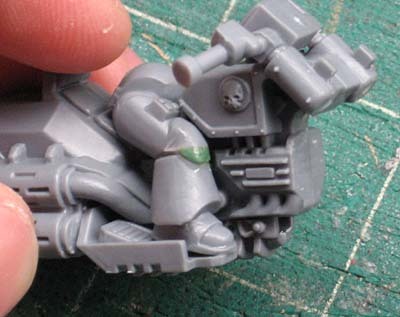 Looks just like the Emperor's Children jetbike from Collected Visions! 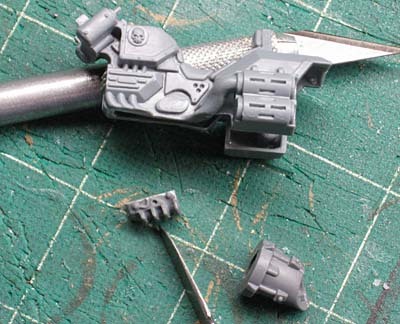 Super cool Idea I think I will use it in my army as a captain and mabye ad a capeor a energy-ax. King: Thanks, the Warp is a truly deep place, there are all kinds of things lurking here.